How long does it take to train for Australian Ninja Warrior? I was attempting to swing from a rope, grab a hanging ball and then transition to a 2nd hanging ball with the other hand… and I wasn’t getting it. I’d swing okay, and then bat the ball, or grab it and fall straight off. Definitely not show off material. Aimee comes in, I’ve met her before. She’s really pretty, super light and athletic, and is training for American Ninja Warrior. My next attempt, with an audience and the stress that comes with performing to a crowd, even just a crowd of one, is a spectacular mess. My worst attempt yet. I’ve inadvertently created a whole heap of suspense and anticipation while at the same time upping the exhaustion in my hands and arms with each try. My next two attempts are blah, then I get to the point where I’m too tired to fail again, so I nail it. The crowd goes bonkers. … I was super confused. Cody pipes in from across the room and tells us that I’m the only person actually training for this season, everyone else has (smartly) started training a year out from the competition they’re aiming for. I never even considered that as a possibility. Cody too, when I met him, had given himself a year to get his body ready, and it makes sense now that I think about it. Ninja Warrior takes so much strength AND agility AND mastery of technique AND endurance AND muscle/tendon toughness. It takes so much and so since most people want to make the most a good first impression, assuming, somewhat correctly that they might only have one shot, they train for not-this-year. So, Australian Ninja Warrior is coming on us really quickly. We honestly don’t have much time to get ready and so if you’re not feeling superstar enough just yet, that is super-totally fine. Start training today… Start really going full bore now. Start developing those strong tendons (which take so so so long) and mastering some skills so that you’re all set for 2018… By then we’ll have a much better idea about what Australian Ninja Warrior is going to throw at us. 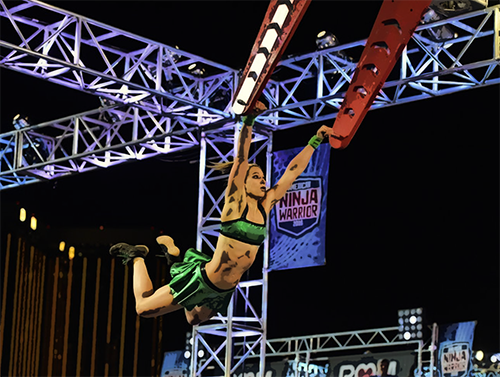 The truth is that people have been training for years and years for American Ninja Warrior, and usually have had a long sporting background prior to starting training. If you’re brand new to any of this, give yourself at least a year to develop the tendon and muscle toughness required. If you ARE feeling superstar enough, get that video in! Got less than 3 days to before cutoff!! I’m in the camp of training for next year’s one. Sounds like its going to get really competitive next year!! I think it’s a good idea though, the more parkour and rock climbing I do… the less it all hurts and the tougher I get, I think it’s wise to make sure the body can take the punishment… cos Australian Ninja Warrior is gonna punish. For sure!